There are only a handful of authors who truly take me away with the character that I feel totally part of the story. Laurelin Paige is one of them. 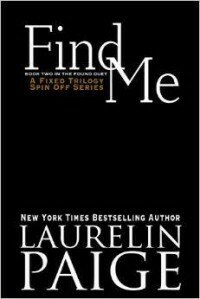 I thought when I first read Free Me she couldn't possibly outdo herself but with Find me she did just that. Beautiful, poignant, loving and I am sad this story is over. Definitely a book hangover read. Every time I get to the end of one of her books I always end up saying to my "Damn that woman can write"